Creamy, laffy taffy-like texture that is airless. Seattleites and Pacific Northwesterners alike – get ready for what might be a life changing experience in ice cream. ACME Ice Cream is coming to your local market and it’s a game changer. Made with all-natural ingredients and without any added air to pump up the volume – each container of ACME’s ultra-premium ice cream brings you one pound of pure, unadulterated goodness in a carton. Other ice creams include up to 50% air per container. Not ACME which adds no air making sure that you get a full scoop of what you paid for – the richest, thickest ice cream on the market. ACME Ice Cream is quite literally a grassroots operation. Nestled into a lush valley next to snow-capped mountains, Whatcom County cows have it made in the shade. A daily feast of sweet grass produces impossibly rich cream, delivered fresh to their facility and utilized immediately. ACME’s artisan crafted ice cream begins the old-fashioned way – by cultivating relationships with local farmers invested in the well-being of their animals, sourcing berries from the nation’s “berry basket” growers a stone’s throw from its tiny hometown of Acme, Washington, and never adding anything artificial to its products. ACME’s ice cream comes from pure sunshine and the very best that nature provides. 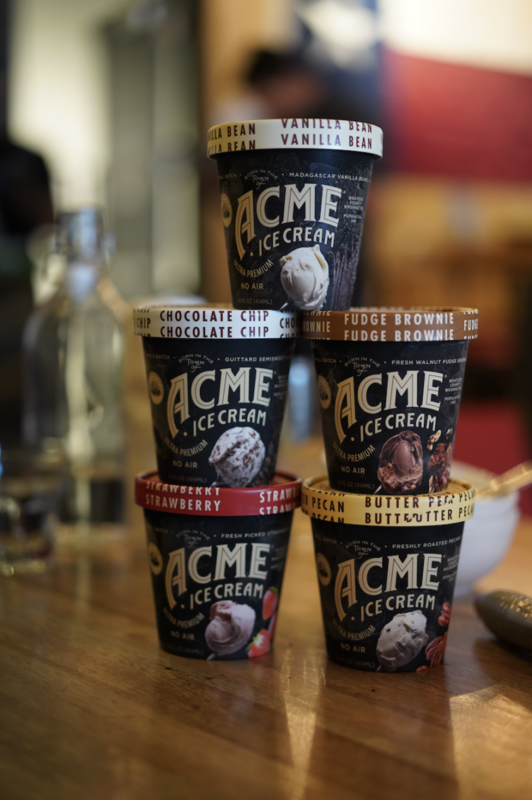 Whether your preference is calm, cool and collected Mint Chocolate Chip, or a rich Butter Pecan that is like a scoop of Southern drawl – ACME has you covered. ACME’s Ice Cream comes in eight flavors and is currently available at all Metropolitan Markets, Haggen, select Whole Foods Marketsand New Seasons Markets and other fine shops and restaurants in Washington State. In addition, ACME is available at its scoop shops in Fairhaven, Bellingham and Eat Local markets in the Seattle area. For a complete list of flavors and locations where ACME Ice Cream is available, visit theirwebsite. During her professional career, Fray has worked in multiple business sectors finding the greatest satisfaction in helping small food companies reach the pinnacle of their potential. A self-proclaimed “West Coast outdoor animal” – she has returned to her PNW roots to nourish the green shoots of ACME Ice Cream. As the quality of ingredients grown in the terroir of Bellingham and Whatcom County connect deeply with her inner-outdoor girl – Fray wakes up every morning excited to have a hand in cultivating the food culture of her native Wild Northwest.